One of the rarest star patterns in all of flag collecting is the Great Star or Grand Luminary pattern, in which the stars of the flag are themselves arranged into the shape of a large star. The pattern itself is a fantastic visual representation of one of the nation's mottos, "E pluribus unum", which is the Latin for "Out of many, One." While some pieced-and-stitched Great Star flags were manufactured by cottage industry flag makers, homemade varieties also exist. 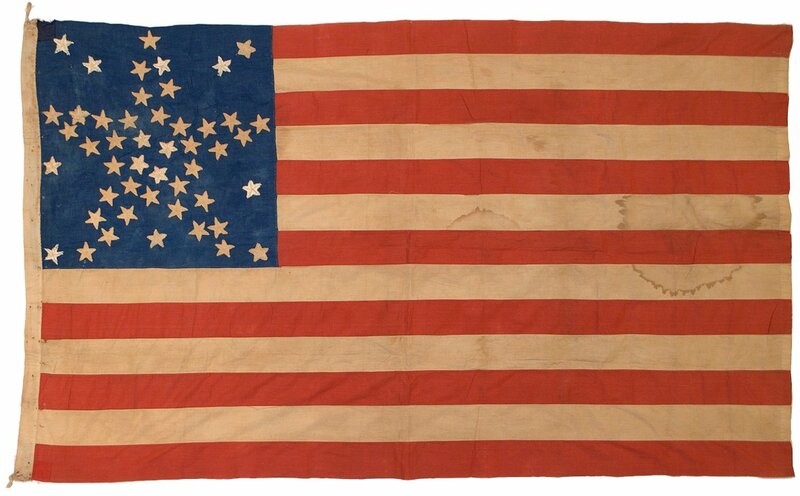 This particular flag is certainly a homemade flag, and the workmanship of the hand embroidered stars not only demonstrates the higher level of effort and skill of the original seamstress, but also is an exceptional example of Americans updating their flags repeatedly over many generations. This is a fascinating case example of how studying the details of a flag's construction can tell a story about the flag's history. 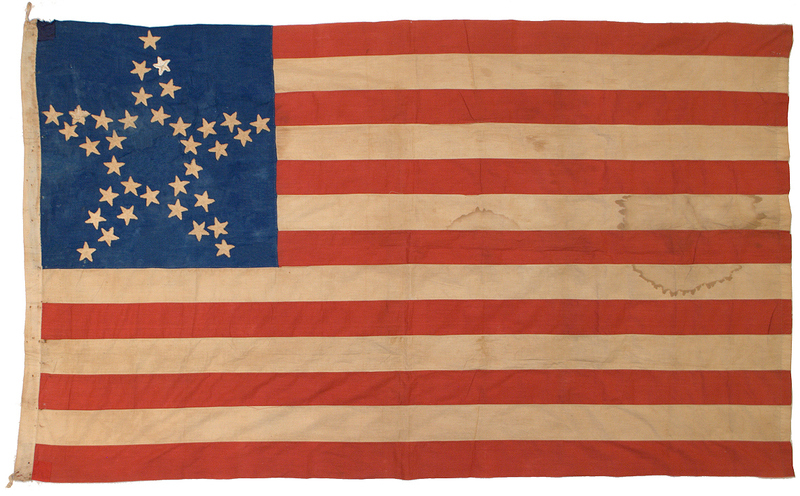 The flag originally began life with 35 stars. 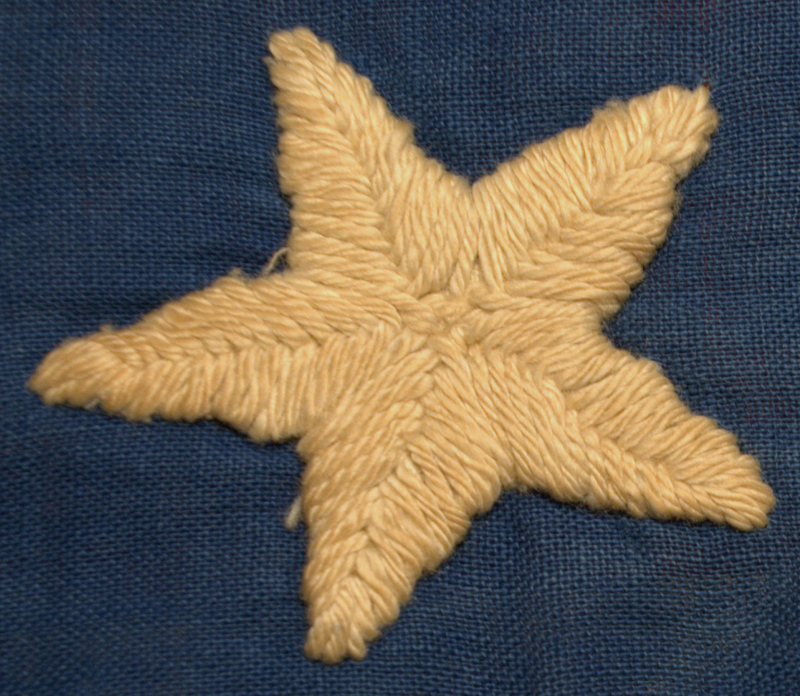 The hand embroidery of the original 35 stars are very finely done. At least two additional sets of stars were added to the flag by two different people of later generations. Three stars, one in the top right corner, one in the bottom right corner, and one directly below the Great Star, were added at the time of the American Centennial, bringing the total number of stars to 38 in 1876. Then, most likely early in the period of 48 stars, circa 1912, 10 additional stars, as well as one replacement for a star in the Great Star, were added, bringing the total to 48. Thus the star count on this one flag spans a period of nearly 100 years. The original stars appear to be constructed solely of embroidery. 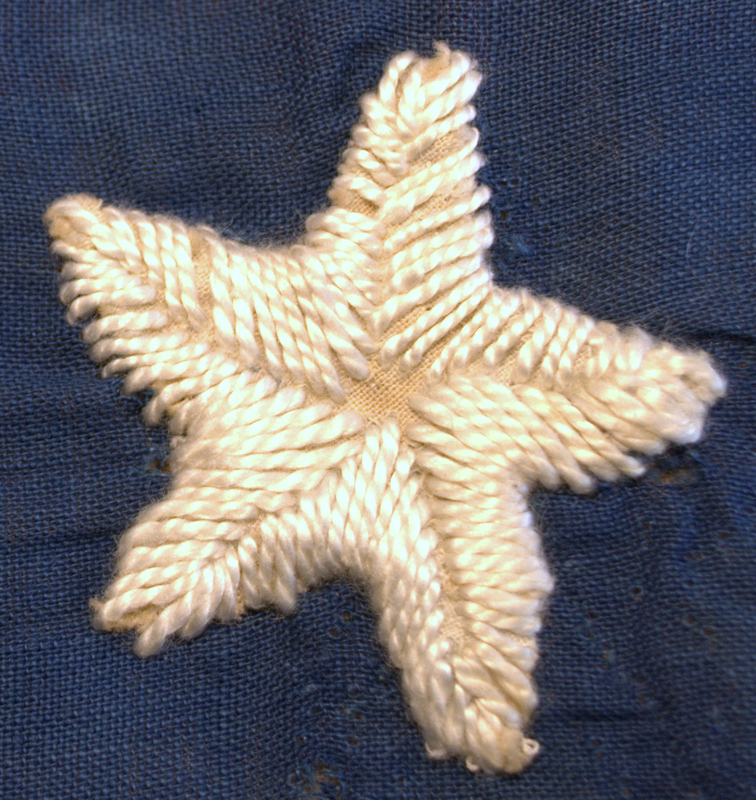 The later stars actually have a cotton base with applied embroidery to simulate the embroidery of the original 35 stars. It's clear, from the distinct differences in the quality of the handiwork of each generation of stars, that they were done by three different hands with different degrees of sewing experience. 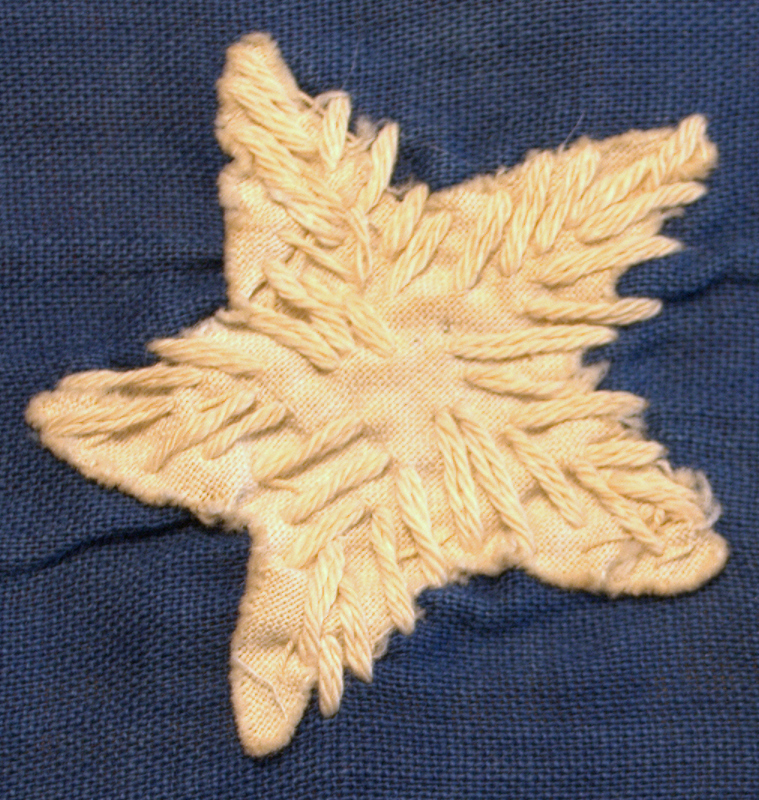 The canton shows evidence of embroidered stars being removed in the spaces between the original Great Star. It's clear that at least one of the seamstresses who updated the flag, most likely the one who updated the flag to 48 stars, was not satisfied at her original placement of the additional stars, and consequently removed them and repositioned them to make a more balanced presentation. The flag itself is made entirely of cotton, with machine sewn stripes and the canton hand sewn into the stripes. The hoist of the flag was originally a sleeve, but at some point the ends of the sleeve were stitched closed, and small ties were added to the top and bottom of the hoist. Overall, this is a wonderful example of American flag making. 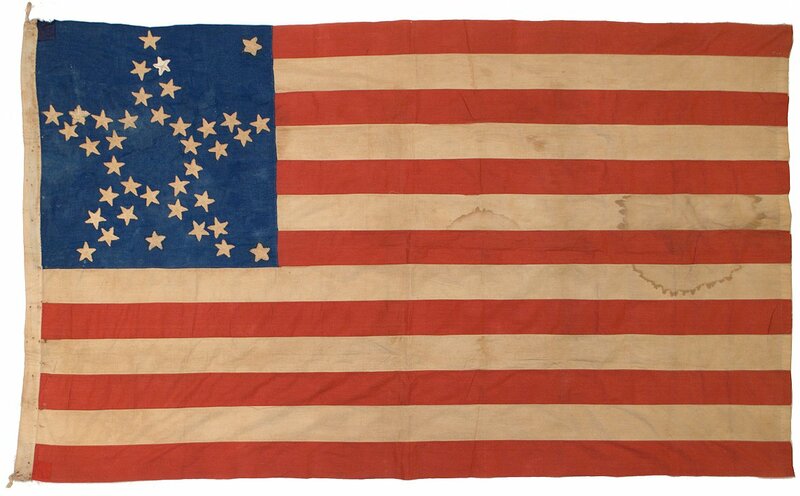 It tells the story of a flag being handed down from generation to generation from the time of the Civil War to the time of World War I, in one of the most coveted and rare patterns in all of flag collecting--the Great Star. Learn more about Great Star Flags.